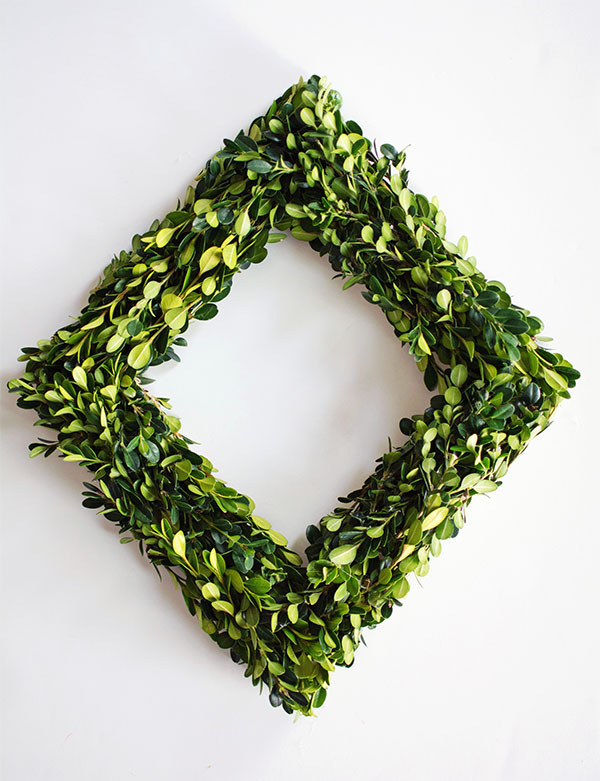 Boxwood wreaths are a holiday classic. They’re gorgeous in their simplicity and I always prefer them on their own without too much fuss. But for a modern take on this traditional decor, I decided to try making one in an interesting shape, like a diamond! It makes for a stylish upgrade while still keeping things simple. –Amy from Homey Oh My! 1. 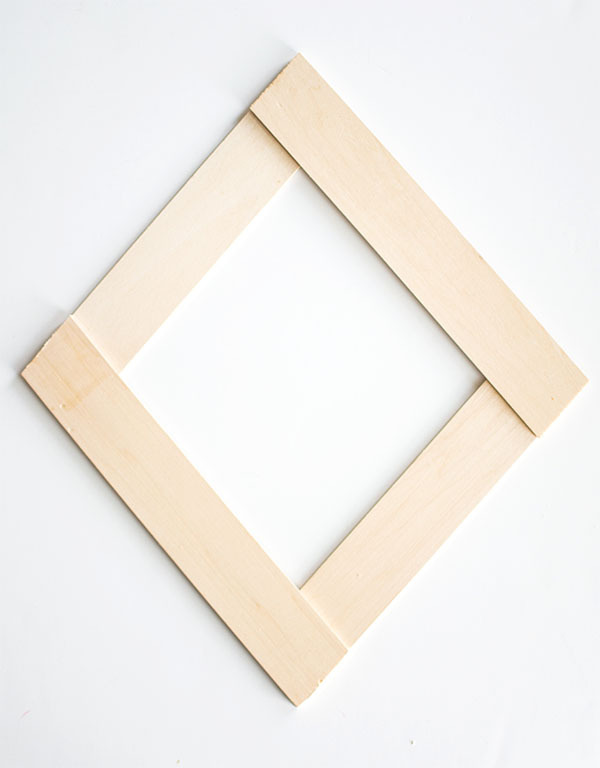 Position the wood in a diamond shape, making sure each side is the same length. The inner edges for this one are roughly 7.25 inches long. 2. 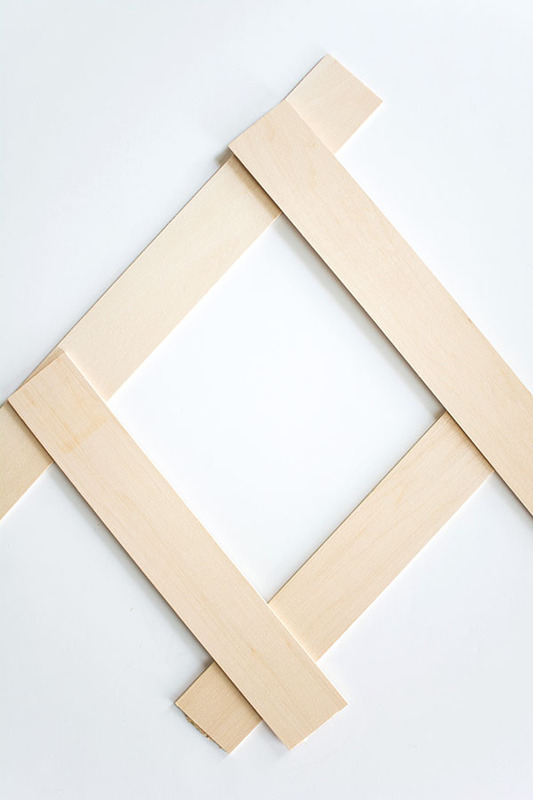 Glue all the wood pieces together at the corners of the diamond with a hot glue gun. 3. Saw off any excess wood extending beyond the shape of the diamond. 4. 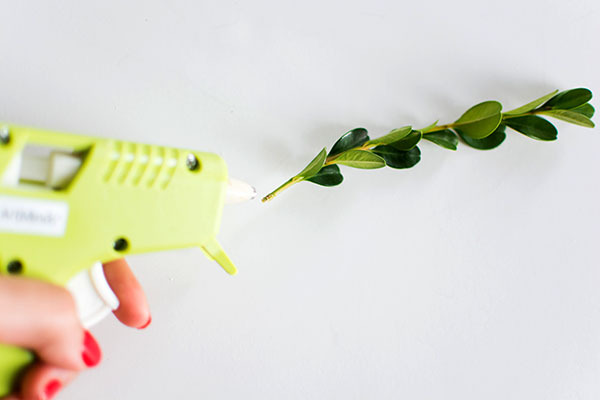 Apply hot glue gun to the end of the boxwood branch. 5. 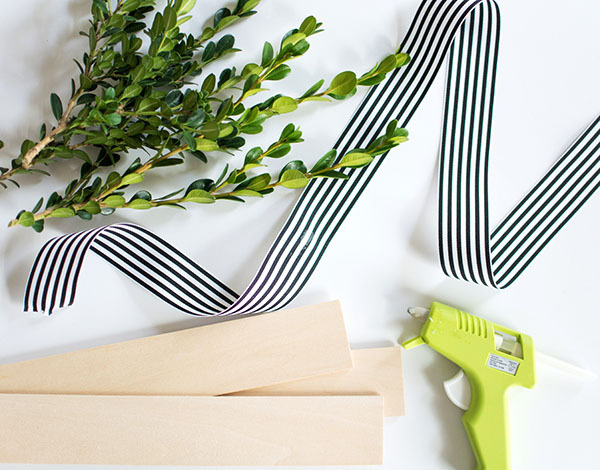 Stick down the end onto the wood while the glue is still hot, then secure the other end of the branch onto the wood by dotting glue underneath it. Hold the branches in place for a few seconds until the glue cools a bit. 6. Repeat steps 4 and 5 all over the diamond, making sure to layer and switch up the direction of the branches to create a fuller look. 7. 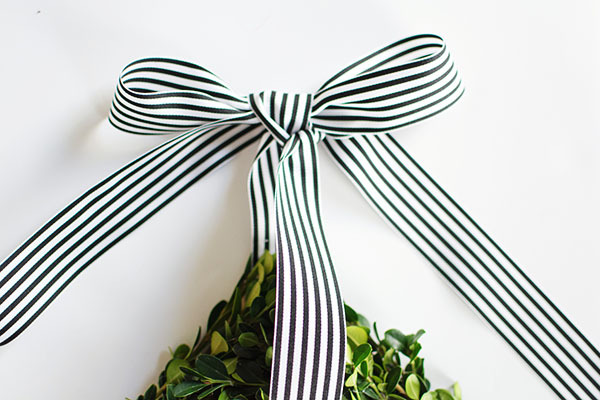 Pull ribbon through the top corner of the diamond wreath and tie a bow. 8. 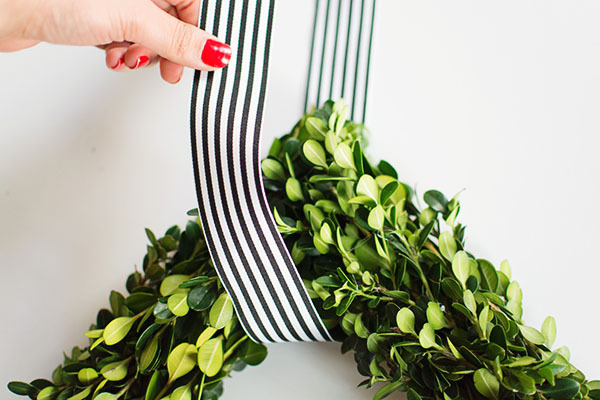 Hang up the wreath, then cut off the ends of the bow at your desired lengths. 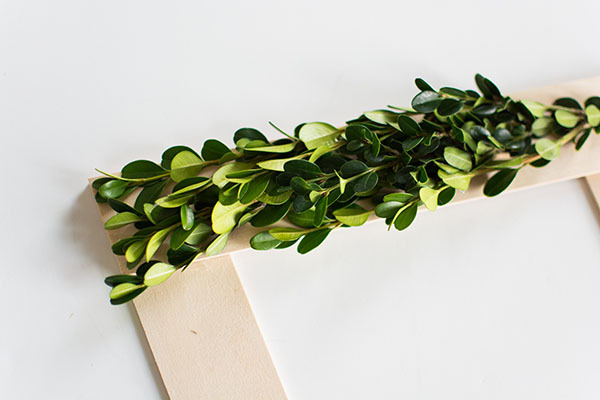 Boxwood branch… do you have your own bush or did you buy it somewhere? I love this! 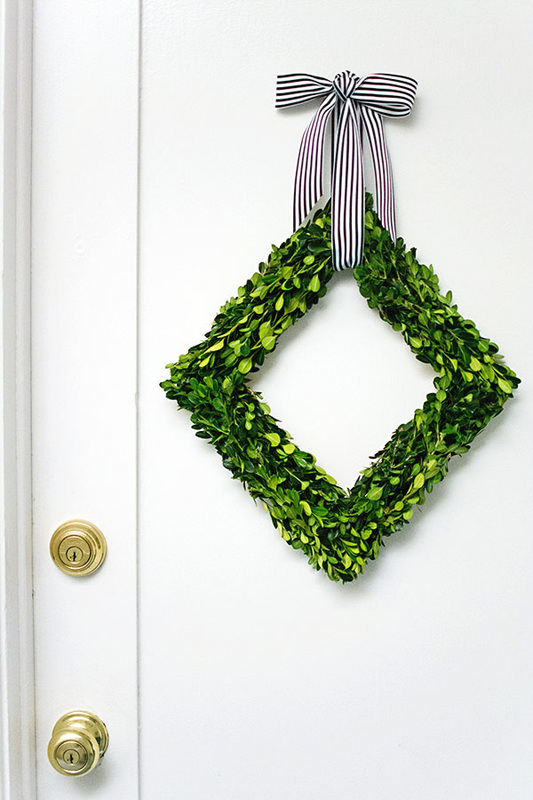 I’ve been wanting to make a boxwood wreath. Do you know how well they dry out? 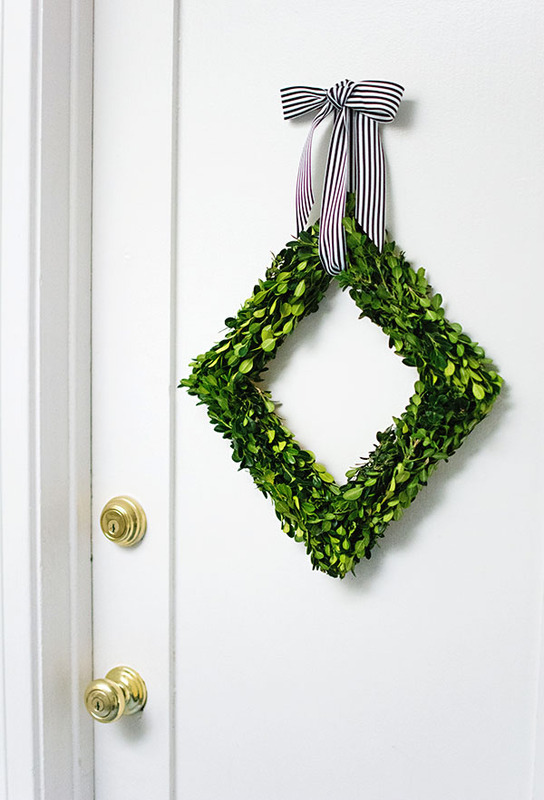 Would a wreath like this last for more than one season, or once they’re dried out are they done? This is so pretty! Forgive the ignorant question… will it last from year to year or will the boxwood eventually turn brown? I didn’t know if it would dry a green color? 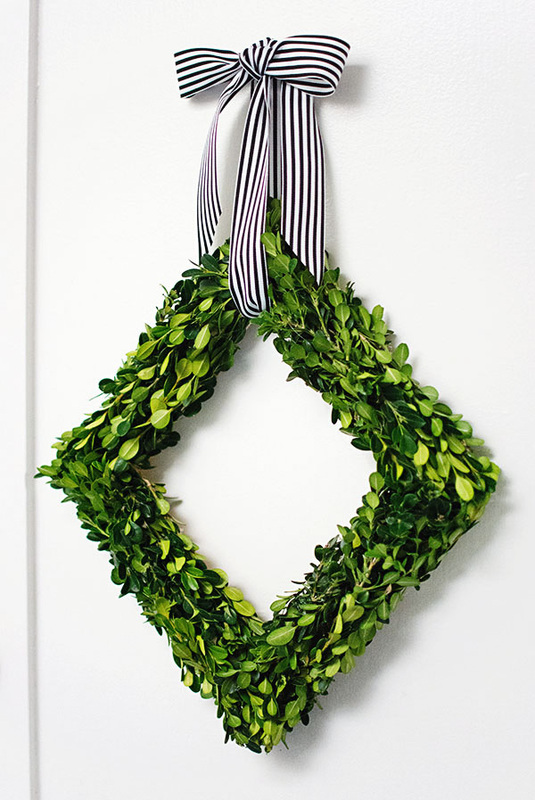 I don’t usually like wreaths, but this is different, I really like it. Loooove it, really need to know how long color will last? Also, I’d think spraying it with a sealer/polyurethane might prolong its color.